After big summer spending in recent years, it seems Manchester United hierarchy just find the way to bring back red devils into past glories. Alex Ferguson started working with Manchester United in 1986, but only had a breakthrough in 1990 when he crowned the FA Cup. Furthermore, he only got to lift his first Premier League title three years later in 1993. For me, Manchester United history divides into 3 parts. Sir Matt Busby time, Sir Alex Ferguson era and post Ferguson era. Transformation from Ferguson to Mourinho, absolutely will take time and money to return Manchester United into its past fruitful situation. In their way to reach the glorious events in the Premier League, they have some disappointing stories. Most Manchester united fans accused Sir Alex Ferguson for dark days of old Trafford in 2013/14 season. Appointing the Scottish man without any silverware in his career was a risky one. Sir Alex’s excuse for this appointment was a single one. He said that Moyes with underrated lads, played bravely against the big ones. If he takes charge of Manchester united with superstars and some signing, the team would continue on his way. But Sir Alex reasoning about his countryman proved totally wrong. Aground Manchester United team with aged players like Vidic, Ferdinand and Evra they needed a revolution to bounce back, but Moyes was not that saviour man. Despite signing Fellaini and Mata, Moyes couldn’t fulfill the expectations and he was sacked as United manager after just 11 month in charge. United placed 7th in the Barclays Premier League, lowest rank in his glory history at the domestic cup. Before the Sunderland clash against Manchester United in January 2017, David Moyes had revealed that things went awry once his plans to begin life in Old Trafford by signing Gareth Bale, Cesc Fàbregas, Cristiano Ronaldo and Toni Kroos were thwarted. Notable Dutch professor was a real deal for the theatre of dreams. His encouraged young talented team in 2014 world cup in Brazil thrashed giants like Spain, Chile and the host team to reach the bronze medal of the competition. Van Gaal’s resume was wonderful one. He crowned championships with giants like Ajax, Barcelona, Bayern Munchen and AZ Alkmaar. He had 18 titles in his museum and his CV was perfect for Manchester united. Rooney, Van Persie. Rojo, Show, Di Maria, Herrera and Falcao turned Manchester united a “New Galacticos.” Van Gaal’s revolution at Old Trafford with more than 100 million pounds spending had worked more or less. United placed fourth in the Barclays Premier League table and they qualified for the Champions League. 2015/16 was a disaster one for Van Gaal. Throwing out of the Champions League in a group with opponents like PSV Eindhoven, Wolfsburg and CSKA Moscow and also poor results in domestic matches made the Dutch man at the verge of sacking but united hierarchy denied the media speculations and let him to keep his job until the end of the season. Lingaard, Rashford and Martial were young blisters at Manchester United’s most boring season. At last, they bring FA Cup award for the Red Devils and Van Gaal’s era ended a little bit of sweet taste at the Wembley. After summers of discontent at the old Trafford, arrival of Jose Mourinho with its controversial and appealing characters seemed perfect for the theatre of dreams. Superstars like Pogba, Ibrahimovic and Mkhitaryan were the things that Manchester united fans and coaching staff wanted. Attack, attack, attack style of play resumed at old Trafford, just after the Portuguese man found his rational 11 starting man with Rojo, Jones, Carrick, Pogba and Ibrahimovic. Mourinho massively proud of his team for the way they had responded after some poor results against sides like Stoke City, Burnley and Watford. 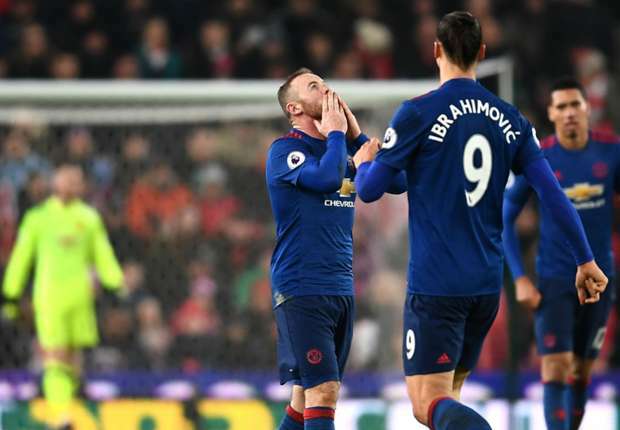 After dramatic last-minute draw against Stoke City via Wayne Rooney’s stunner and record breaker goal, Manchester United’s unbeaten run extended to 17 matches. Check how to bet on Rooney’s team in the US. This is obvious that Jose Mourinho’s Manchester United is on the right path. Just one question, who can lose the tempo with superstars like Pogba, Ibrahimovic, Rooney, Martial, De Gea, Mata, Mkhitaryan and also special talents like Rashford and Lingard?